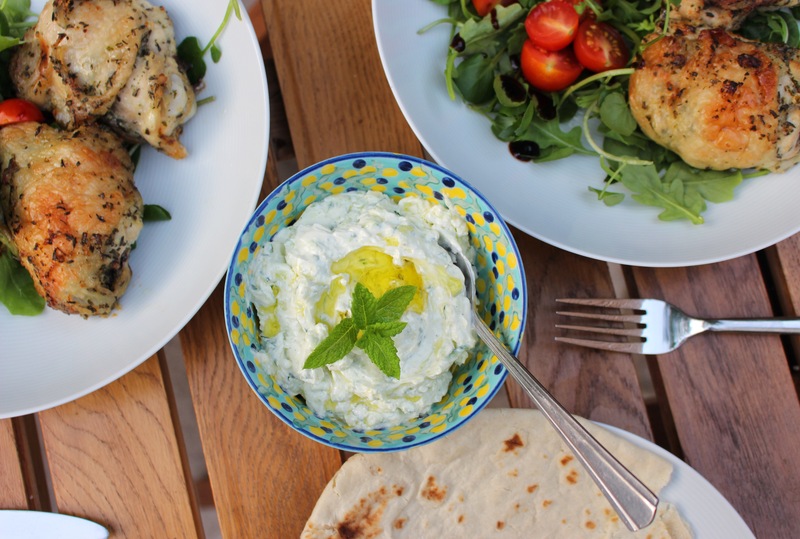 Tzatziki to have with everything | dash.drizzle.dollop.devour. It’s hot hot hot out there isn’t it? So hot, all I want to eat is cucumber and watermelon, cooking is barely on the agenda. So for days like this I want a bowl of cool tzatziki in the fridge, ready to have a flatbread dunked into it or to be dolloped over a salad. It somehow adds richness whilst still being refreshing, and turns odds and ends from the fridge into a little summer feast. I remember the first time I went to Crete, we stopped for lunch in a little cafe one day and I ordered tzatziki and a Greek salad, not the most adventurous lunch, but I was amazed by how different the tzatziki there was to the slightly insipid pots you get in the supermarket in this country. It was so thick and creamy, fairly pungent with garlic, utterly delicious. Having eaten that, my main quest in making my own has been to replicate that thick creaminess. This involves dedicating a bit of time to straining everything thoroughly, nothing complicated, but it’s enough to make the difference to the end result. Start by lining a sieve with muslin or some sturdy kitchen towels. Dollop in about 300g Greek yogurt, then wrap in the muslin, cover with a small plate or bowl and a heavy weight of some sort, so that it’s pressing down on the yogurt. Pop the sieve over a bowl and leave in the fridge for an hour or two for some of the liquid to drain out. Partly peel half a cucumber, cut into quarters lengthways and remove the seeds. Coarsely grate into another cloth and squeeze firmly to wring out excess water. I like a bit of peel for some colour, but not all of it. Add the cucumber to the thick drained yogurt, along with half a clove of crushed garlic, a spritz of lemon juice, a tablespoon or two of good olive oil, a small handful of chopped mint and some salt and pepper. Serves two. I’d highly recommend making a big batch of this although note that the garlic flavour intensifies the longer that you keep it. Sounds delicious! ~ I’ll let you know how I get on!